or chromaticity of the source itself. It describes the apparent whiteness of the lamp. Sources having a low correlated color temperature (2700K to 3400K) are said to be “warm” in color such as Warm White, Warm White Deluxe, and Designer 3000K (D30) and Designer “800” 3000K (D830). (Most incandescent lamps have a color temperature between 2700K and 3000K.) Fluorescent sources having higher correlated color temperature (4100K to 6300K) such as Cool White, Cool White Deluxe, Daylight Designer “800” 4100K (D841), or Designer 4100K (D41) are said to be “cool” in color. The Designer Series and OCTRON Lamps having a correlated color temperature of 3500K are considered “mid-range” and provide excellent color rendition while not being either “warm” or “cool.” The correlated color temperature of the light source contributes greatly to the overall visual appearance of the lighted space. light) to blue (cool light). Color Rendering Index (CRI) is an international numbering system from 0-100 which indicates the relative color rendering quality of a light source when compared to a standard reference source of the same correlated color temperature. It expresses the degree to which colors will appear ‘familiar’ or “natural” under the light source being selected. In general, the higher the CRI number, the better the color rendering properties of the light source in question. The color rendering index of any two sources should only be compared if those sources have the same correlated color temperature. Color temperature figures, SPD curves and CRI ratings provide helpful information, but they are not perfect. Color temperature, for instance, fails to indicate anything about how a given light source will render colors. two light sources with similar color temperatures will look the same but may have slightly different color properties. In general, a high CRI figure means a light source will render colors well. 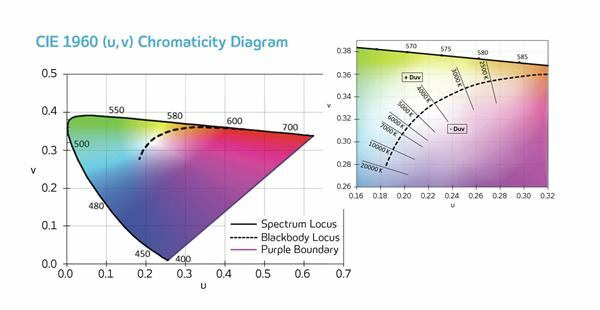 Since CRI is based on an average of eight different colors, a light source with a high CRI will not necessarily reproduce every color equally well. Used in conjunction, however, all these measurements can provide excellent benchmarks for the comparison of light sources. Noontime Sunlight The SPD of sunlight show it to be an evenly balanced light source with all wavelengths of visible light present in nearly equal quantities. 95+ Incandescent The SPD curve of a standard incandescent lamp shows little radiation in the lower end of the spectrum. This explains why the lamp type tends not to render blues very well. 75 Cool White Fluorescent This curve, typical of standard fluorescent lamp, shows how the addition of a halophosphor coating smooths out the spectral energy spikes of a gaseous discharge light source. 75 MetalArc® Metal Halide The spectral energy from metal halide lamps is relatively even, but there are some distinct gaps. For most application, these gaps are not significant, allowing these lamps to render colors suprisingly well. 21 Lumalux® High Pressure Sodium The SPD curve for an HPS lamp show an intense concentration of spectral energy in the yellow portion of the spectrum. It should be obvious that his lamp is unable to render colors accurately.